Loading dock, factory behind, RR tracks in the foreground. Looking east across the Grand River. 1872: Company founded; incorporated the following year. 1945 – 1957: Company operates as a subsidiary of Sligh-Lowery, but continues to produce furniture under the Grand Rapids Chair name. 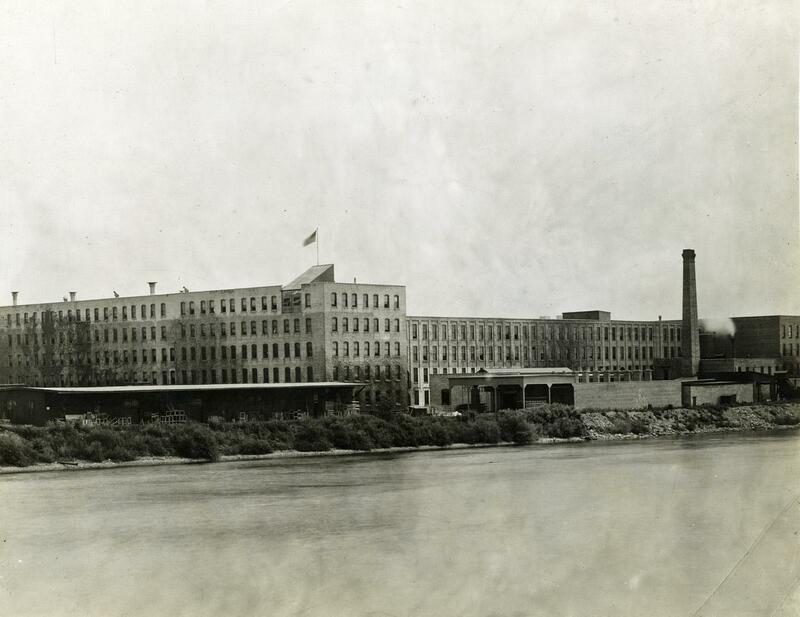 1957: Firm is purchased by Baker Furniture Co., but furniture is still produced under the Grand Rapids Chair name. 1973: Factory and assets fully integrated into Baker; furniture no longer made under the Grand Rapids Chair name. 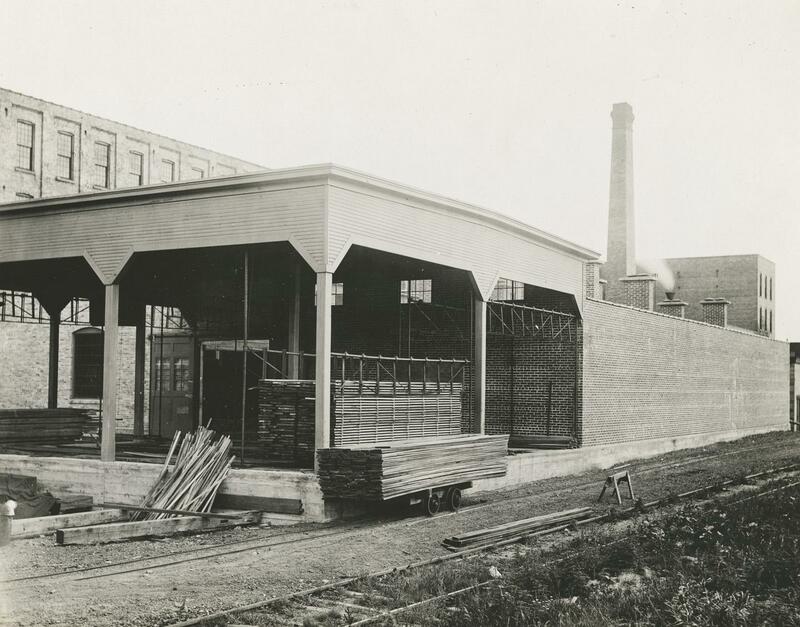 The company was founded by a partnership that included local lumber, sawmill, and furniture baron Charles Carter Comstock as president, along with officers Elisha Foote, Henry Fralick, and S. W. Worden. Elisha Foote ascended to the presidency of the company in 1900, followed by Roger Butterfield in 1920. 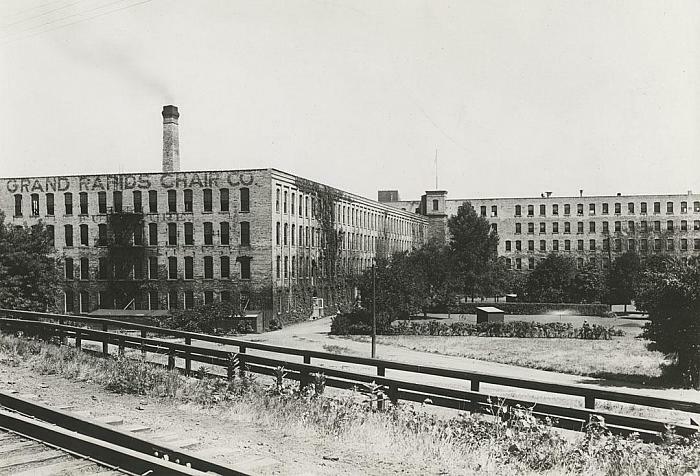 He was succeeded by Elisha’s son F. Stuart Foote, who ran the firm until its sale to Charles R. Sligh, Jr.
Elisha Foote was responsible for bringing John E. Brower, Sr. from New York to Grand Rapids sometime in the 1890s. He served as the company’s chief designer until his death in 1915. His son, John M. Brower, started the Brower Furniture Co. in 1919, to manufacture unfinished chairs for Grand Rapids Chair and its sister company, Imperial. Brower was succeeded in the 1920s by George Fletcher and Carl Hammarstrom, who designed a full range of historical revival lines. Renowned designer Kem Weber created an Art Deco dining and living room group for Grand Rapids Chair Co. in 1928. Grand Rapids Chair Co. designs between 1945 and 1973 often came from staff designers of its parent companies Sligh and Baker. Herbert Ten Have designed the “Cross Country” line. Early 20th-century ads show both Golden Oak case pieces with serpentine fronts and cabriole legs referencing French historical styles, as well as Mission oak pieces. A 1900 article also lists mahogany, birch, maple, and bird’s-eye maple in their lines. Ads from the 1910s and ‘20s show dining room furniture, living room, and hall furniture, and spinet desks in a wide range of period styles, including Spanish Renaissance, Spanish Gothic, Elizabethan, Jacobean, Georgian, Adam, and Early American. Favored woods were walnut and mahogany. A Tudor line called “Castle Oak” seems to have been a flagship product in the early twenties. In 1928 Grand Rapids Chair introduced the “Gaylady” Group, which may have been the name for its first modern line by Kem Weber. Its pieces featured the soft lines of French Art Deco, with light and dark contrasting woods and “artistic color treatments.” During the 1950s the company made the “High-Lo Table,” aimed at newly married couples with small apartments. It featured an adjustable height mechanism, which allowed it to transform from cocktail table to card or dining table. The “Cross Country” line was a modular unit ensemble introduced in 1950 and marketed by Sligh. Its Scandinavian Modern styling and flexibility made it particularly suitable for ranch-style homes. The entire factory was eventually devoted to production of the Cross County line. Beginning sometime in the 1910s or early 1920s, Grand Rapids Chair Co. adopted a logo that was basically a square frame of molding with chamfered corners that surrounded the words “GRAND RAPIDS CHAIR COMPANY/GRAND RAPIDS/MICHIGAN.” These were printed in a distinctive block type, which used triangular shapes for the rounded letters. An elliptical trademark was adopted for the “Dexter” line in the 1940s. The original rectangular logo was updated as a rectangular chiseled plaque in the late 1940s.